We are a group of dedicated parents and educators who are in the process of setting up a non-profit Sudbury Education Centre in Hong Kong. This is the first organisation in Hong Kong that is dedicated to self-directed learning! Sudbury Education HK is part of an international network of more than 50 organisations based on the highly successful Sudbury Valley, which is located in Massachusetts in the US and was established in 1968. Sudbury education centres are run democratically so that each child’s voice is heard and valued. Children are trusted with the freedom and responsibility to direct their own education. Instead of tests, grades and homework, we offer members ages 5-18 unlimited opportunities for self-directed learning in a supportive community environment. Graduates move into their adult lives confident, articulate, resourceful and self-motivated. Michell grew up and graduated in Hong Kong and started to rethink education after reading a book about Sudbury Valley School. While studying Early Childhood Education and Psychology in the United States, she visited a Sudbury model school and was deeply impressed. She has worked in some children’s bookstores in Taiwan and Hong Kong, and taught in international kindergartens. With over 10 years of experience working with children, Michell considers the Sudbury approach as one that truly empowers children to be responsible for their own lives, and be the best version of themselves. Meanwhile, she organized self-healing workshops and committed to personal growth. She realized that self-awareness is the key factor that helps her see things from children’s perspective and respect them as who they are. After her child was born, Michell has been a full-time mother unschooling her child, putting self-directed learning into daily practice. In 2014, Michell co-founded EDiversity, a non-profit organization promoting diversity and alternatives in education. In 2017, she gathered a group of like-minded people and created a pioneering Sudbury community in Hong Kong. Her mission is to empower children to live out their passion and potentials. Leah is originally from Miami, FL and currently lives in Hong Kong with her husband. Shortly after graduating university, she left to teach English in South Korea as she was keen to explore the world before returning to the finance industry. She developed a passion for education and returned back to the United States to study education in order to become a qualified teacher. She has never looked back since then and has spent the last five years in Hong Kong as an international primary teacher. As an adult, Leah hasn’t lost her curiosity and creativity in both her personal and professional life. She loves to learn and gain knowledge through reading and trying new things which led to her discovery of the Sudbury Model. She is keen to bring innovation and cutting-edge practices into education where children are the architects of their own learning. She believes the Sudbury Model is a timeless education that will allow children to learn naturally and develop the skills that will prepare them to thrive in the future. After many years of traditional schooling experience, Roger loves reflecting upon different topics about education. His university major in Social Work has greatly inspired him to explore the different perspectives of education. He was especially drawn to the humanistic approach he experienced during his placement in a secondary school. Seeking to know different education approaches and philosophies after watching the movie “Summer Hill”, he spent half a year, as a helper, in Sudbury School Paris. He participated in the the 4-day event named European Sudbury Workshop, where Sudbury staff from all over Europe could discuss differents topics about the Sudbury philosophy. His experience in Paris plays an important role in facilitating the future growth of Sudbury Education Hong Kong into an established Sudbury School. By witnessing the Sudbury model through practical experience, and encouraged by a group of Hong Kong parents who are “Sudbury fanatic”, Roger is truly inspired to contribute to the birth of a Sudbury school in Hong Kong. Sylvia is a mother / yoga instructor / advocate for Sudbury Education & respectful/mindful parenting, who began to unschool and respectfully parent her children since 2015. She believes her role as a mother is to nurture and encourage her children to be the truest version of their passionate selves. She believes children have equal rights as adults and aims to treat them with respect. She believes it is the birth right of every child to direct her/his own education because only she/he knows her/himself best. She trusts that every child is unique and would benefit greatly with a personalised education that is harmonious to his intrinsic qualities. She loves the Sudbury model because it fosters lifelong learning and harnesses children’s curiosity, passion and creativity into individualised knowledge and skill sets that are adaptable to the ever-changing future. 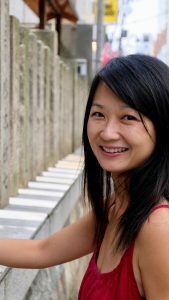 Originally born, raised and educated in Hong Kong, Sylvia moved to Sydney, Australia with her family in her early teens to continue her secondary & tertiary education in Industrial Design. Upon completion, she spent the following years working in Music Production, Graphic Design, Web Design, Photography, Music Video Production, Television Commercial Production, and Floristry. It was her spiritual awakening in 2015 that sparked the discovery of her life mission in promoting self-directed learning in Hong Kong.